The eschatological reading is limited to the preceding card of Nimrod, whose crown and tower of Babylon are broken via God's wrath. But even that is not really eschatological, but rather just the destruction of a ruler. I would argue the concerns of the Sola Busca are when and whom will God's wrath fall upon (mainly in an astrological sense). 2. the second time seemingly signifying the cosmos, "rampant" within a starry armillary-like sphere, just above the head of the sleeping/dreaming(?) Nebuchadnezzar. 28 When the Babylonians heard about it, they were very indignant and conspired against the king, saying, ‘The king has become a Jew; he has destroyed Bel, and killed the dragon, and slaughtered the priests.’ 29 Going to the king, they said, ‘Hand Daniel over to us, or else we will kill you and your household.’ 30 The king saw that they were pressing him hard, and under compulsion he handed Daniel over to them. In the Sola Busca trump, there is no hint of Daniel killing the dragon, merely Nabuchodenasor and his "living god", a "great dragon." But this dragon is not necessarily evil in the earlier appearance in the Sola Busca, tamely sitting before Olivo. But also consider that some read the preceding figure of Metelo in the context of Olivo and Ipeo, as the "SC" banner Metelo holds can be combined with "Ipeo" to spell "Scipeo"; and it has already been pointed out that the wingless dragon would seem to go with the dragon wings on [Sc]ipio. 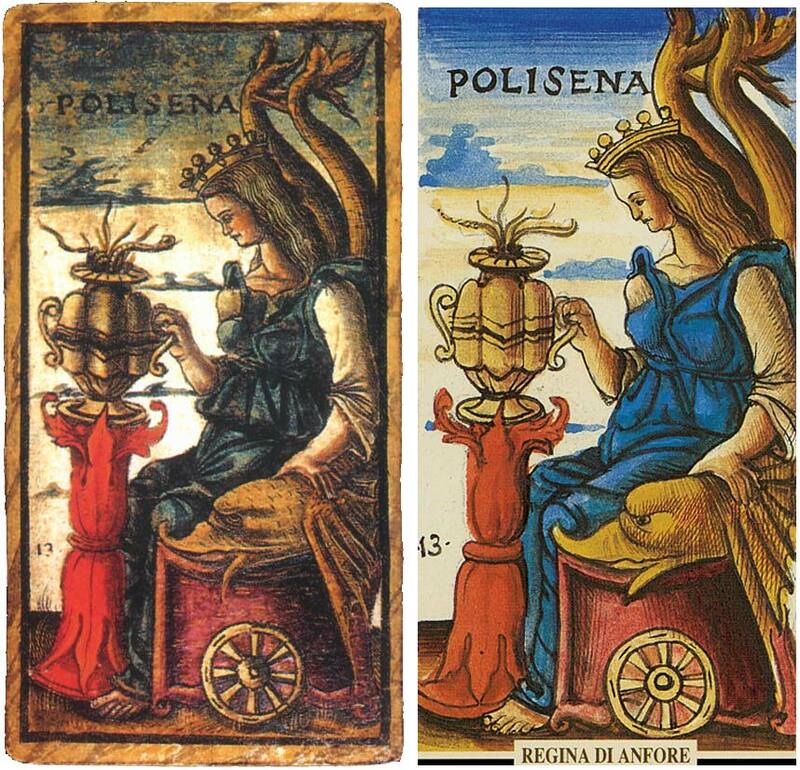 There is thus a suggestion of an operation of combination, and Metelo, pointing his wand at the column mounted Hero of Alexandria-like steam-powered device, seems to be initiating that, perhaps in an Picatrix (alchemical) context (see also the Queen of Cups, Polisena, seated on a dolphin throne beholding a serpent atop a similar urn-like object upon a column; dolphins would point to Delphic Apollo). But if the wingless dragon is with Olivio, who in turn is Livy (? the held scroll being one of his works of history), is that dragon then history, or more properly "Time" (which is what the fully formed dragon in the Nabuchodenasor card's armillary sphere suggests, the movements of the celestial bodies marking Time)? [Sc]ipeo then as a seerer, necromancing with a soul, lost somewhere in time (see also Lucan's necromancing episode via a magical concoction in Book VI of his Pharsalia) , enabled by the alchemical operation? But what exactly would be that operation? The passage in Daniel 14:23–30, written in Hellenistic times, points to a very Picatrix-like magical concoction that kills the dragon: "pitch, fat, and hair, and boiled them together." Since the dragon is not killed here, but rather assumed by the magical operator (the wings on [Sc]ipeo), the concoction rather somehow enables the "soul's vehicle" of the operator to explore Time. by a magician or by melancholy [is apt to bring about]. (Ficino, Commentary on Plotinus, in Opera omnia, II, 1711). "I have said elsewhere that down from every single star (so to speak Platonically) there hangs its own series of things down to the lowest...Under the celestial Serpent or the entire constellation of the Serpent-bearer, they place Saturn and sometimes Jupiter, afterwards daemons who often take on serpent's form, in addition men of this kind, serpents (the animals), the snake-weed, the stone draconite which originates in the head of a dragon, and the stone commonly called serpentine...By a similar system they think a chain of beings descends by levels from any star of the firmament through any planet under its dominion. If, therefore, as I said, you combine at the right time all the Solar things through any level of that order, i.e., men of Solar nature or something belonging to such a man, likewise animals, plants, metals, gems and whatever pertains to these, you will drink in unconditionally the power of the Sun and to some extent the natural powers of the Solar daemons." (Ficino, Three Books on Life, trans. Kaske & Clarke, Bk. III, Chap. 14, 1998: 311). To return to the highest of the court cards, Alexander the Great flying griffin throne (a "soul vehicle" in my opinion) and holding an orb in the same shape as Nabuchodenasor's armillary sphere, ,what is he to fly through if not precisely history/Time, as exemplified by the Classical and Biblical figures that make up the Sola Busca trumps? as Olivo, the oil of annointment, is emblematic of (Anointed) Kings (which brings to mind the Holy Roman Empire? Maybe? The creature on Olivo is a Basilisk, emblematic of Royalty [from Basilieus - King, as the astrological sun is significator of Kingship, as Olivo, the oil of annointment, is emblematic of (Anointed) Kings (which brings to mind the Holy Roman Empire? If you do an image search for "medieval bestiary Basilisk" you will see animals that are almost all winged, which still begs the question of the relationship of the Olivo's animal with the dragon-winged-man in the next card, "Ipeo". That you connect Ipeo "with the draconic forces - that 'will end in Babylon'" is most baffling in light of the iconographical concerns of this deck. Neither Ipeo not Alexander are shown negatively, not in any connection with Babylon, and if Ipeo is Scipio Africanus, which seems most likely, then him communicating with a spirit is clearly a reference to the Dream of Scipio where he talks to an ancestor in the celestial spheres (which speaks to the concern of the deck's inscription, Trahor fatis, in the context of astral influences). Back to the Basilisk, Albertus Magnus in the De animalibus cites Hermes Trismegistus as the source for the story about the basilisk's ashes being able to convert silver into gold - clearly connected to the alchemical concerns of the deck (otherwise where is an "Ipeo" connected with being a rex? Certainly not Scipio Africanus). The point of the basilisk has to be as a symbol of transformation (and I would argue, to induce a dream-state peculiar to that of Scipio, and opening up all of history - especially classical and Old Testament history - as the scope of investigation). Again, Olivo holds a scroll - obviously a book (and if Livy, a history - i.e., learning as a means of transformation), and Olivo looks back at Metelo performing some kind of ritual (holding a wand-like stick at the bronze vessel with steam/smoke emitted through various openings, like Hero of Alexandria's machine, but probably meant to be a model of the cosmos with various celestial fires represented). We are far from Christian eschatological concerns here. The opening card of the deck, Ace of Coins, lays out the humanist goals - Hercules-Atlas pose as a symbol of the self, as does the two of coins featuring the classical hero above a "modern" (Renaissance) scholar, where the latter even wears the standard black cap of Venice, as worn by B. Bembo in this c. 1480 painting (who even holds a coin of Nero, a classical figure who is also in the deck): https://upload.wikimedia.org/wikipedia/ ... _small.jpg. These two opening cards have nothing to do with Revelations; rather the humanist on the two of coins is to emulate the classical exemplar to which he is literally appended (e.g., a Scipio). Yes Venice was Christian like the rest of Europe, but where you are getting Revelations as a primary theme out of this deck baffles me. 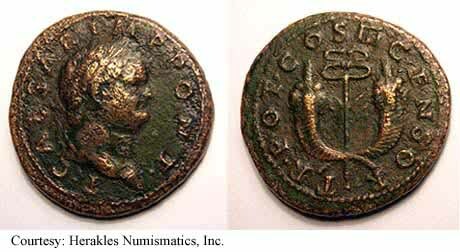 "With this imitation of an antique coin Girolamo drew parallels between himself and his classcial predecessor --- Girolamo's son ottaviano could even become a new Alexander the Great"
Considering that the Romans were held up as exempli by the humanist culture of Venice (and elsewhere), I don't see where there is any room for your biblical pejorative of "beasts"; e.g., how does that apply to such humanist heroes as Marcus Tullius "Tullio" or even Cato(ne) in trump XIII (Dante praises Cato, despite his status as a pagan suicide who opposed Caesar, by calling him in his Convivio 4.28.15 the human being best suited to represent God and then imagines his spiritual salvation - freed from Limbo at Christ's Harrowing of Hell - and divinely-ordained function in the afterlife in the Comedia, Purg. 1.31-108, 2.118-23 ) . Only Nero is negative, assuming that the child-into-fire isn't a symbol of something less literal. I don't even see how Nebuchadnezzer is demonized as a beast - he simply seems to be dreaming of the encompassing celestial serpent in the armillary sphere, as a Magi from the East, albeit perhaps negatively associated with Saturine melancholy. In fact his sleeping/contemplative pose on this last card of the deck mimics the left cupid in the first Ace of Coins card of the deck, who rests his head on hand in the classic melancholy pose with the Trahor fatis inscription overhead in place of the dragon. The dragon is astral-related, not Anti-Christ related, as there is not even a single explicit reference to Revelations in the Sola Busca. 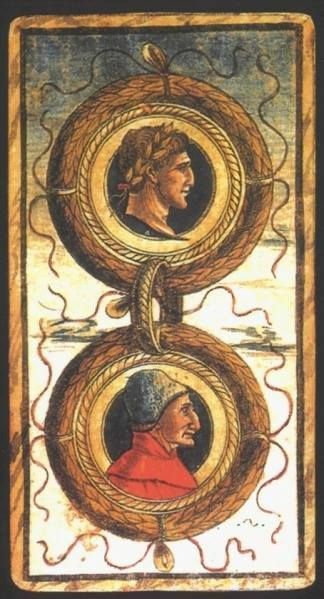 To quote Ficino again: "Under the celestial Serpent or the entire constellation of the Serpent-bearer, they place Saturn ...." (M. Ficino, Three Books on Life, trans. Kaske & Clarke, Bk. III, Chap. 14, 1998: 311). Plutarch in Life of Alexander wrote: "As for the lineage of Alexander, on his father's side he was a descendant of Heracles through Caranus, and on his mother's side a descendant of Aeacus through Neoptolemus; this is accepted without any question. And we are told that Philip, after being initiated into the mysteries of Samothrace at the same time with Olympias, he himself being still a youth and she an orphan child, fell in love with her and betrothed himself to her at once with the consent of her brother, Arymbas. Well, then, the night before that on which the marriage was consummated, the bride dreamed that there was a peal of thunder and that a thunder-bolt fell upon her womb, and that thereby much fire was kindled, which broke into flames that travelled all about, and then was extinguished. At a later time, too, after the marriage, Philip dreamed that he was putting a seal upon his wife's womb; and the device of the seal, as he thought, was the figure of a lion. The other seers, now, were led by the vision to suspect that Philip needed to put a closer watch upon his marriage relations; but Aristander of Telmessus said that the woman was pregnant, since no seal was put upon what was empty, and pregnant of a son whose nature would be bold and lion-like. Moreover, a serpent was once seen lying stretched out by the side of Olympias as she slept, and we are told that this, more than anything else, dulled the ardour of Philip's attentions to his wife, so that he no longer came often to sleep by her side, either because he feared that some spells and enchantments might be practised upon him by her, or because he shrank for her embraces in the conviction that she was the partner of a superior being. "But concerning these matters there is another story to this effect: all the women of these parts were addicted to the Orphic rites and the orgies of Dionysus from very ancient times (being called Klodones and Mimallones) and imitated in many ways the practices of the Edonian women and the Thracian women about Mount Haemus, from whom, as it would seem, the word "threskeuein" came to be applied to the celebration of extravagant and superstitious ceremonies. Now Olympias, who affected these divine possessions more zealously than other women, and carried out these divine inspirations in wilder fashion, used to provide the revelling companies with great tame serpents, which would often lift their heads from out the ivy and the mystic winnowing-baskets, or coil themselves about the wands and garlands of the women, thus terrifying the men. "However, after his vision, as we are told, Philip sent Chaeron of Megalopolis to Delphi, by whom an oracle was brought to him from Apollo, who bade him sacrifice to Ammon and hold that god in greatest reverence, but told him he was to lose that one of his eyes which he had applied to the chink in the door when he espied the god, in the form of a serpent, sharing the couch of his wife." Albeit in the SB - the sequence is inverted! ?